Many say “this time it’s different!” when speaking about the upcoming elections to the European Parliament on May 22-25. They refer to the candidates five European parties present on-top of their lists to get elected president of the European Commission according to the majority the elections will bring. This is up to us, voters, to decide! The top candidates for the Commissions’ presidency put faces on the European elections and stand for different political positions of the parties in the European Parliament. For the fist time the choice has a face and is political. It is time to ask your TV-channel to broadcast the “presidential debates” of all candidates, live at primetime and in the main programme of the public channels. Media are important to communicate these faces and their content. European democracy, European public and the European citizens needs debate and the possibility to participate in it via the public media. 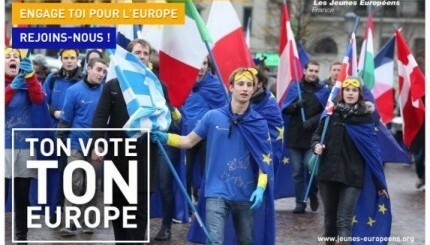 European elections with European candidates have to be communicated to the citizens! Thus, this would be an important contribution to European democracy: let the candidates present themselves to us, voters and tell us that there is a political choice to make. Sign the petitions addressing European TV-channels to broadcast the presidential debate on April, 28th, May 8th and 15th and ask your national TV-channels to broadcast them. ←Kick-off party for the MovEurope bus tour!